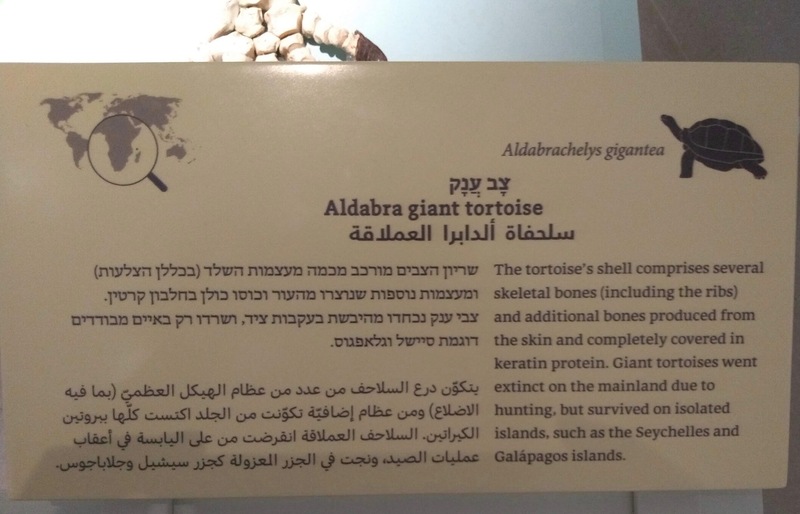 I’ve previously written about two natural history museums in Israel that either didn’t mention evolution or covered up the evolution exhibits with curtains when school groups of creationist Haredis (hyper-orthodox Jews) were visiting (see here and here). The two were the Museum of Natural History and the Biblical Museum of Natural History, both in Jerusalem. I’m writing to draw your attention to something that I believe is of interest to you. 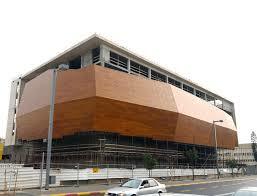 I just completed a careful tour of the new museum of natural history in Tel Aviv University. 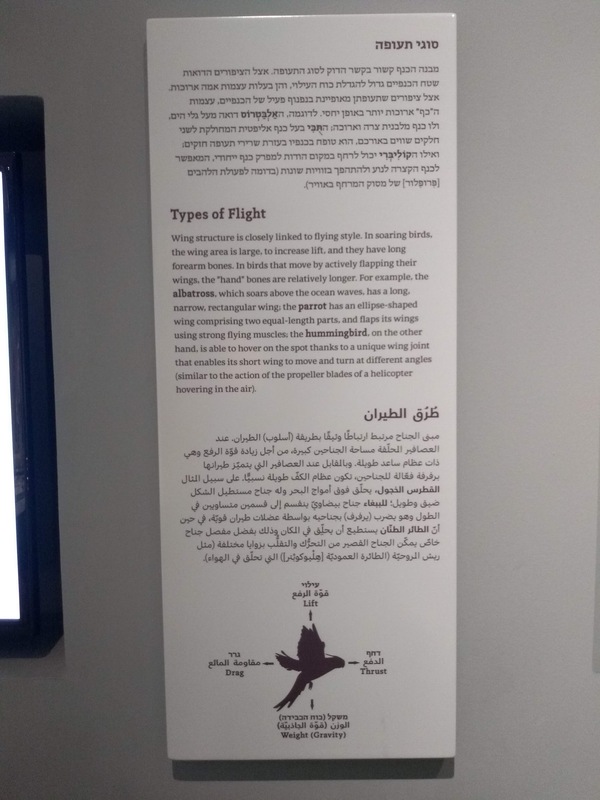 Celebrated as the only natural history museum in the Middle East [JAC: well, that’s not exactly accurate], it turned out to also be the only natural history museum in the world where the topic of evolution is deliberately avoided as to not to offend religious people. In the whole museum I could find only one sign that included the word ‘evolved’ (or any other derivation of it) and one sign with a phylogenetic tree; neither included any further explanation. One or two signs mentioned ‘million of years’ again without any explanation. In one sign they used ‘developed’ where it should have been ‘evolved’. Here are some of the photos, one showing the mention of evolution. Phylogeny without any mention of evolution. How are students supposed to understand this? Note how the word “evolution” is avoided in the explanation below; the euphemism used is “developed over millions of years through a process determined by heredity.” That’s bogus and even wrong: evolution isn’t determined by heredity: processes like natural selection also play a role. The avoidance of “evolution” is painfully obvious. The museum can be found at 12 Klausner Street, Tel Aviv. The building architecture itself is a mix between a treasure chest and Noah’s arch [sic], representing the large range of biodiversity found inside. Seriously? Yes, I know the statement is taken from a quip from J. B. S. Haldane, but of course he was an atheist. 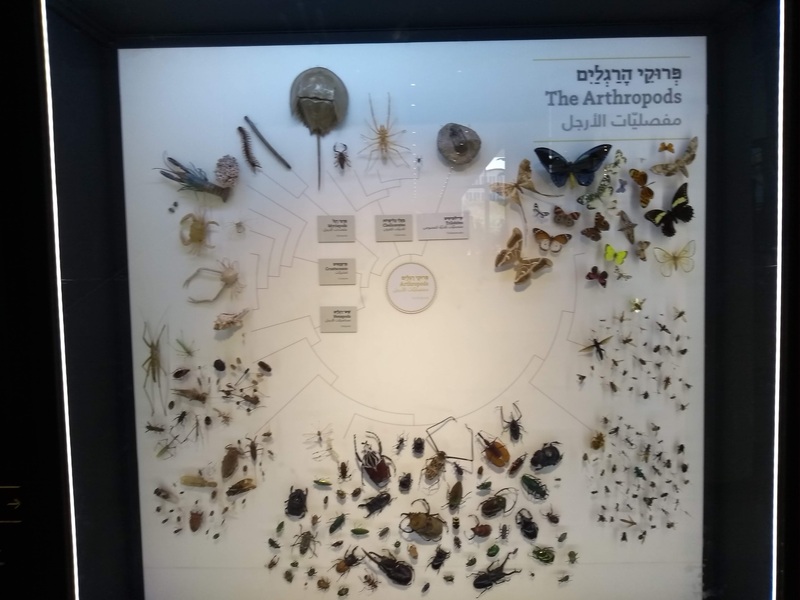 It’s unbelievable that a natural history museum in one of Israel’s best universities can almost completely omit mention of evolution—the process that produced the diversity of flora and fauna on display. It’s especially embarrassing to me because I’m sure this was a deliberate omission, made to satisfy those Orthodox Jews who don’t accept evolution. As a secular nonbelieving Jew with genetic ties to these people, and as an evolutionary biologist, I find this deliberate ignorance on the part of the Museum—and the religiously based creationism of the Orthodox to which the Museum caters—appalling. Here’s a video about the Museum (notice that they refer to it as an “ark”), again omitting all mention of evolution. Founding benefactor Michael Steinhardt (his wife Judy was co-benefactor) remarks at the end, “The natural history museum here in Israel will do more for the next generations of young people than just about any other institution I could envisage.” NOT IF THEY LEAVE OUT EVOLUTION!—the great lesson that underlies the whole exhibit. The Museum Chair, shown in the video above, is Professor Tamar Dayan (see other officers here and the scientific staff here). The page listing donors and partners also notes that “The museum operates under the auspices of the Israel Academy of Sciences and Humanities.” SERIOUSLY? The Israel Academy of Sciences and Humanities? Are they aware of the quasi-creationist enterprise they’re sponsoring? 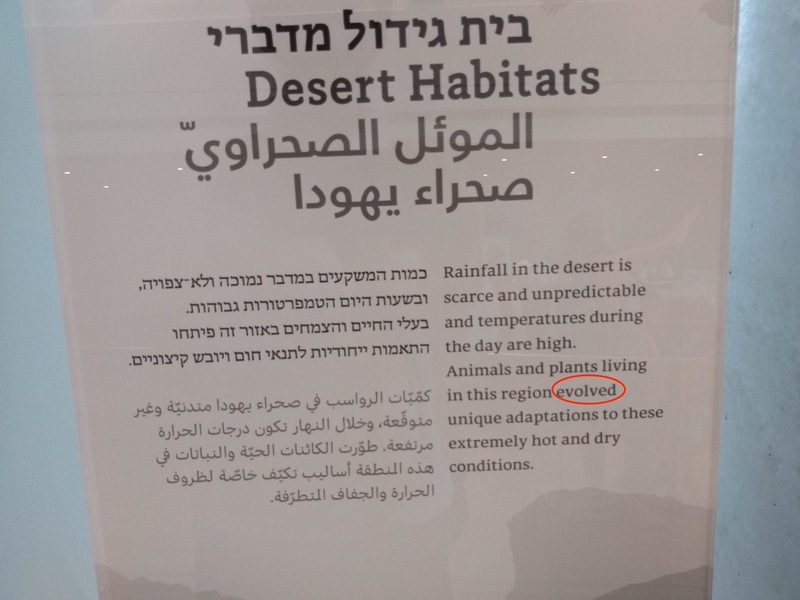 As an evolutionary biologist (and secular Jew), I’m appalled to find that Tel Aviv’s new Steinhardt Museum of Natural History omits all mention of evolution except a single time, confusingly referring to it as “development.” I firmly believe, and have heard, that this omission was deliberate, designed to avoid offending those Orthodox Jews who don’t accept evolution. It is insupportable for a major natural history museum like yours to have a huge building and many exhibits devoted to evolution while deliberately obscuring the process that produced the organisms on display. I was also disturbed to find that the Museum operates under the auspices of the Israel Academy of Science and Humanities. There is no credible explanation for the lack of mention of evolution in your Museum save as a concession to creationists. If you have another explanation, I will be glad to hear it. 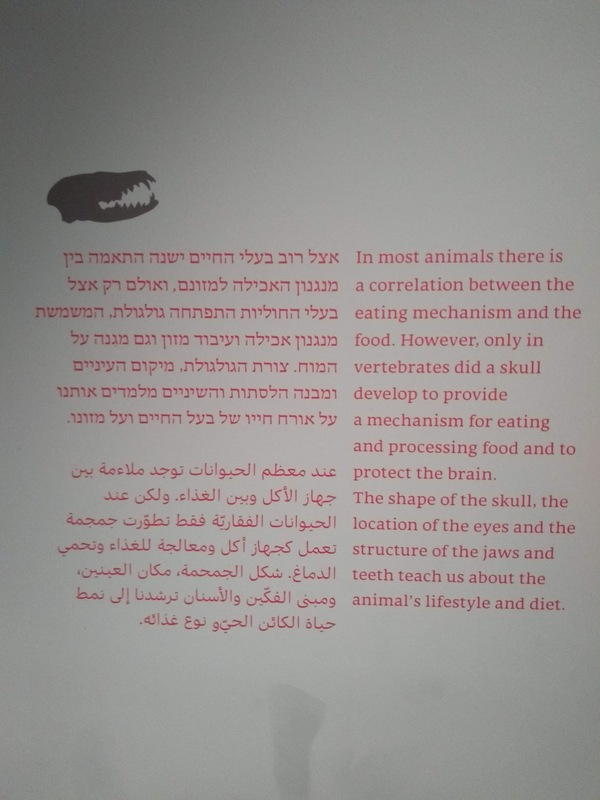 In the meantime I have posted about your museum on my website, “Why Evolution is True,” which has 56,000 readers; my post is here: https://whyevolutionistrue.wordpress.com/2018/08/08/the-new-natural-history-museum-in-tel-aviv-built-to-look-like-noahs-ark-deliberately-omits-mentioning-evolution/ . I will also contact some Israeli newspapers. I implore you and your scientific staff to put evolution in its proper place in your museum. As Theodosius Dobzhansky (my academic grandfather) said, “Nothing in biology makes sense except in the light of evolution.” I hope you can fix your museum so it can make sense to the many people who visit. This entry was written by whyevolutionistrue and posted on August 8, 2018 at 8:30 am and filed under creationism, Jews behaving badly, science education, science literacy. Bookmark the permalink. Follow any comments here with the RSS feed for this post. Both comments and trackbacks are currently closed. Outstanding letter. The reply will be something to see. I look forward to that, providing of course she does reply. O ! exasperatingly and appallingly sad, Dr Coyne. The numskulls who wrote that were clearly tip-toeing around to avoid saying evolution. Pathetic. The only soft spot is between the ears of the godly. Reality needs a trigger warning. Might have been worth having other distinguished evolutionary scientists sign the letter. Probably won’t have much of an effect but it would show that you are not alone. No time for that. I may email my post to other Israeli scientists who work at or with the Museum. A real shanda, you ask me. The last line here is applicable. Michael Steinhardt may be unaware of what’s going on with the wording of the displays, but he must know about the Ark shape. WIKI says he’s an atheist & amateur botanist – he lives in New York state, he’s 77, he’s richer than god & he may be in need of a second home soon due to certain irregularities regarding antiques. His criminal dad financed him through Wharton School MBA 1960 [8 years before Donald’s degree] & gave him packets of cash for his first trading investments. ” In 1995, he closed his fund stating, “I thought there must be something more virtuous, more ennobling to do with one’s life than make rich people richer,” before making a 2004 comeback to head WisdomTree Investments, a fund with nearly $43 billion USD in assets under management. So, here in the last sentence they do mention evolution, and at least imply that they (or Tel Aviv U) do research on the subject. Does anyone know if the New York Museum of Natural History, or if the Smithsonian Museum of Natural History in Washington have displays that mention evolution? For the SMNH in Washington, there are mentions of evolution. For example, they illustrate whale evolution by showing skeletons of different proto-whales. The evolution of Elephants is also illustrated. I heard that they opened a new hall about Human origins and evolution but I didn’t see it. Now that is most interesting, to say the least! With no evolution displays they can save on curtains when the Haredi come to visit. I thought that pressure from the Haredim must be at the bottom of this. The phylogeny diagram of arthropods is indeed just that– only a classification scheme drawn as a tree. But they do get it right by showing that insects are classified within the crustacea. The worst for me was the panel that painfully avoids referring to convergent evolution: “The relationship between form and function (??) has led to similarity among animals from genetically distant groups that contend with similar living environments.” Just say it! Say the words! The deliberately static, snapshot descriptions of organisms seem very common on this museum’s signs and elsewhere as well. 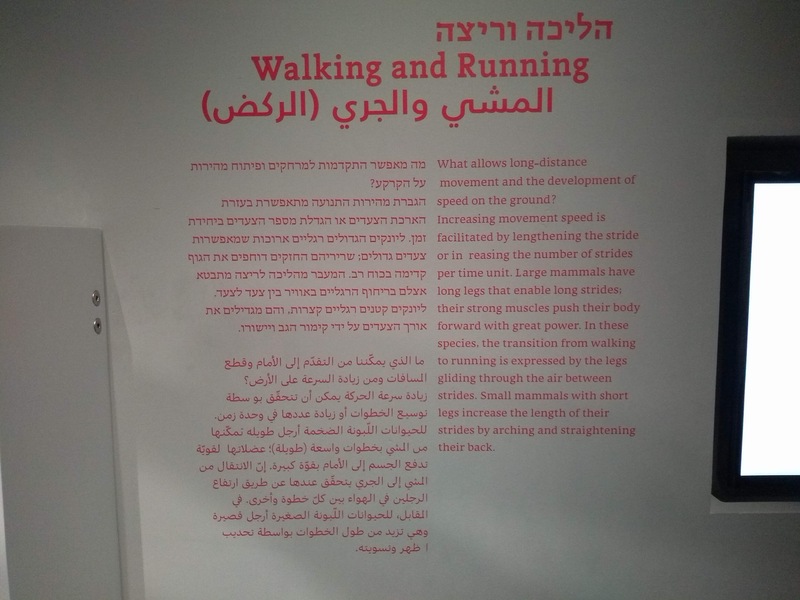 That is why I believe – not able to read the original – that “long-distance movement and the development of speed on the ground” and “transition from walking to running” is referring to how an individual mammal increase stride length et cetera as the sign details. Maybe there is even less mentioning of evolution than a hopeful biologist may read into it? I am at loss why this happens in a secular democracy. I would suppose the motivations are mainly for fear of losing attendance. Religion is strong in the society of this secular democracy. “Religion is strong in the society of this secular democracy”? Israel is among the least religious countries in the world: https://www.haaretz.com/israel-china-among-least-religious-nations-1.5350737. Unlike most of the Middle East where 82 percent of people consider themselves religious, in Israel “just 30 percent say they are religious and 65 percent say they are either not religious or convinced atheists”. It is about equal with the level of religiosity in England and Scandinavia, the poll found, which are among the least religious areas in the world. And that’s including Arab citizens of Israel who are more religious than Jewish. (55% of Israeli Arabs are very religious or religious while only 20% of Israeli Jews are haredi (ultra-Orthodox) or religious, https://www.ynetnews.com/articles/0,7340,L-3890330,00.html). Hmmmm I was wondering about this. TMYK. So why, if they are such a secular society, would this museum feel the need to bend to a crazier kind of religion? Because the only reason modern Israel exists is due to crazy religionists and their book of crazy claims. The modern Zionist movement, inspired by Revolutions of 1848 and the drive of nations to self-determination, as well as by persecutions of Jews in all countries they lived in, was a secular movement whose purpose waas to give the Jewish nation a homeland and national self-determination. Israel was the only place on the planet where Jews had (thousands of years ago) a state from which they were expelled. Since the Romans expelled Jews, there was never any state on this territory – it was always a (neglected) province of one or other Empire. At the same time, through these thousands years, Jews retained their language, culture, religion and yearning to return and again be independent. It’s also relevant that in spite of repeated expulsions by diverse occupiers for all these thousands of years, there was always a Jewish presence in Eretz Israel. I am glad to stand corrected. So why this pandering to religion? Oh yeah, I know: ‘Democracy’, politics, and pressure groups. No? Another fine letter, PCCE. It will be most interesting to read the reply from Prof. Dayan, if such a reply is received. Very disappointing on many levels. The Dr. Tamar Dayan that I’m aware of is a top ecologist. I hope she will rectify the matter. Religion and ignorance entwined in mutual support! I’m glad someone brought this to your attention; this is a battle worth fighting. Your letter is impossible to refute; hopefully they take heed. The displays that I could see look well done (I hate the architecture); it shouldn’t be too difficult or expensive to change the placards. By this logic, Darwin’s most famous book would be considered anti-evolution. No, it would just be considered unfit to teach evolution to today’s students, which it is. The differential survival of natural history museum populations is solely dependent on the truth, truth intermated or omitted is not good enough, without this, we have no evolution of progress, only regress and in lies, extinction of natural history to fairytales. Amazing how some folks will volunteer to become a STEM underclass. More spots in the top university science programs for mainstreamers. I never understood what problems religious people have with evolution, since they could explain it away as a tool of their god(s) like everything else in this world. In fact, many modern believers do exactly that, but countless others still don’t. Some religious leaders took an early stance against evolution, and their successors never had the courage to issue the correction. Also, some scientists, including Prof. Coyne, think that evolution theory is incompatible with religion. When presented with such a choice, some religious people will abandon religion, but others will be up in arms against evolution. I suspect the problem with the Haredim is thornier than we can appreciate. I do have some sympathy with the museum management who must anticipate and prepare for reactions/protests from this demanding crowd. While I hate to see the zealots kowtowed to, I also hate to see the creators and developers of this museum also have to deal with socio-political issues that they’re not really equipped for. Given the way the Haredim reproduce, it would seem the government must take action sooner rather than later to develop policies and programs to bring these people out of the stone age.